I'm looking for the equivalent of Build List output from inside a loop using the Process List node. Or in QC terms, the Iterator Variables patch. Say I have a list of images and I want to locate them according to the order they appear in the list. (Please note I can't use Arrange in Grid/Row/Column because they either resize the image or position it in a way that isn't suitable to me). count_of_list is total number of items in list. Still yet to get nodes that will wire together and do it though. I think this setup will give you an output which resets to 0 whenever a new list hits the 'Process List' node, and then increments with each iteration through the list. When 'Count' receives an event on its 'Set Count' port, it would inject an extra event into the loop which wasn't created by the 'Process List' node, so the 'Hold Value' should suppress that. It work! Thanks. 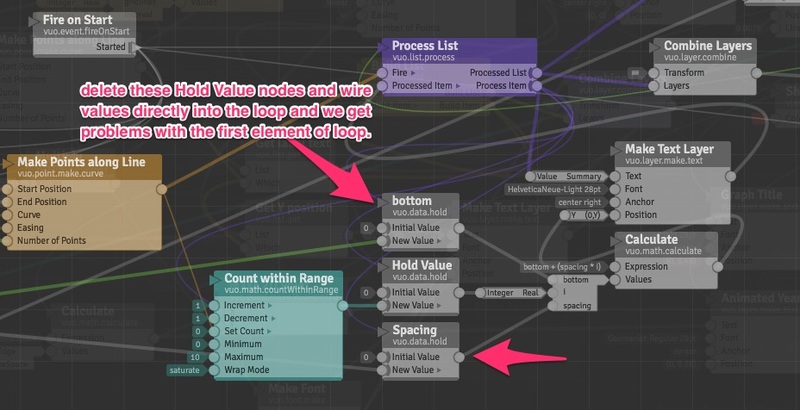 It also helped me realise any values coming into the loop from outside seem to need Hold Value nodes on them in the same way to stop spoof values getting in and messing with the first item of the iteration. Wow that was very helpful because that's weird first-element-in-list-is-wrong thing has been bugging me for days now! I'm adding an example comp for those who come after me. If we remove the "bottom" and " Hold Value nodes and wire those values directly into the loop we get a "Hello World!" text image in the list of layers. Reset nodes' datatypes when copied in the Editor and cables are removed.